Reference #23082 (1) Used CITIZEN VDF201L Single ID Tool Holder Serial No. : 85013M NOTE: This Tool Was Used On A CITIZEN M20 CNC Swiss-Type Turning Center In A Facility That Manufactured Precision Medical Devices. Reference #23088 (1) Used CITIZEN VTF512L Single ID Tool Holder Serial No. : 06003M NOTE: This Tool Was Used On A CITIZEN M20 CNC Swiss-Type Turning Center In A Facility That Manufactured Precision Medical Devices. NSK / Nakanishi high speed live tool spindle - 60,000RPM - several available. Tons of tooling for Star machines. Ecas and SB16 and other models. 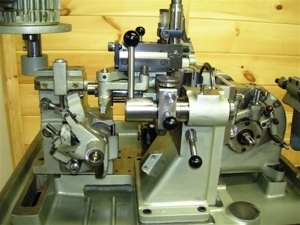 Thread whirlers, inserts, right angle live tools, live gang tools and live back working tools, static holders, NSK High Speed Spindles, Tool Kits. PART NUMBERS AVAILABLE UPON REQUEST.